It took me longer to build and set him up in this super seat deluxe thing than it took to take the actual pictures. I was only able to get these two shots before his head starting bobbing all over the place and he started crying. Note to self: Brace yourself, this is just the beginning. Welcome to parenthood. Oh and another thing, why does everything have to be built? Yikes!! 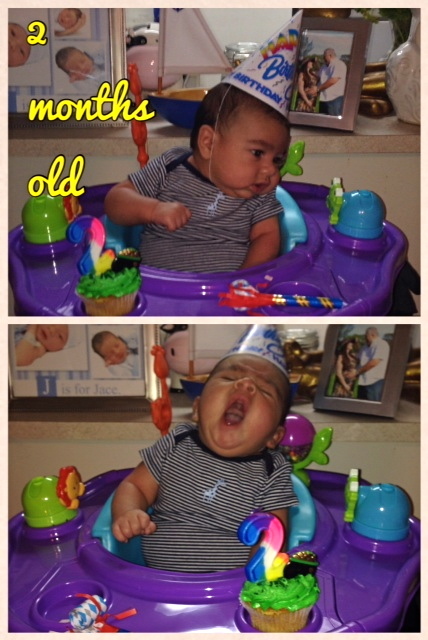 This entry was posted in Love, Reflection, Thoughts, Uncategorized and tagged 2 months old, happiness, joy, joy and happiness, motherhood, my boy, parenthood, pictures, special moments by justm3lly. Bookmark the permalink.